David Gest: flaming homosexual ladies man, botox abuser, former spouse of Liza with a Z, and friend of Michael Jackson, has something new to add to his description. Comedian. That's right, Mr Gest is planning a one woman man comedy show in England beginning this February. Apparently he's something of a star across the pond. Who knew? I'm sure that show will be hilarious. Just the thought of it makes me laugh. Wonder how he'll pay tribute to his ex? Maybe by copying her recent red carpet ensemble? He definitely has the bod for it. OMG I love your blog! This post is hilarious! Lol but you're too nice to him, you gave him the gift of a square jaw!.. He looks even more freaky in reality than in your drawing! What a clown!! I've been gone for a few days, but I'm so glad I'm back!! Your David Gest has made my day! 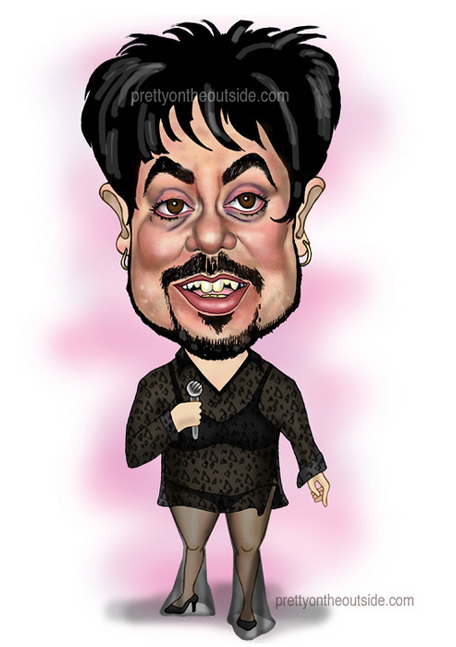 I find it hard to look at David Gest, but your illustration makes it much easier. He's going to make a great comedian - all he has to do is stand on stage and not say anything. He'll bring down the house.